The arena where I ride has a magnificent view of Mt. Pilchuck. 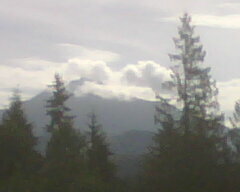 On days like today, when the sky is misty and a few clouds flirt with the summit, it looks enchanted. The forest between me and the mountain appears uninterrupted, inviting. It appeals to the romantic adventurer in my soul, despite the fact that to make a hike through the woods to the summit I know I'd have to hack through the underbrush, ford streams and rivers, and climb impossibly steep, rocky inclines. Dreaming about it is definitely better. has an active imagination. 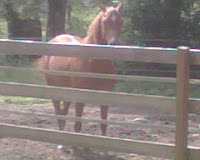 Apropos of nothing, he will scamper around, buck magnificently then look around to see who noticed. Eddie doesn't care. He sees him do that stuff every day for hours and hours. Besides, he's--not so secretly--more impressed with himself. I enjoy watching, though. Rocky is good for a laugh or two. He's such a happy horse. 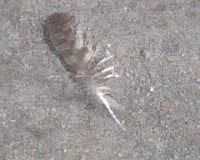 And then there's the feather that's been lying in the arena for the past few days. I think it came from a hawk, and I keep meaning to pick it up. Not sure why--it's just cool. be eating treats over the fence, but we have a clinic to prepare for. If I don't make an effort and come to the party, I'll not only fail to make progress, I'll regress. 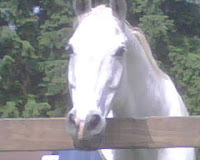 I know full well if one doesn't pay attention when one rides all sorts of little things creep in to sabotage one's efforts--a little "crooked" becomes a bigger "crooked," a little "on the forehand" becomes a sincere balance issue with the horse leaning on one's hands. Even when one is concentrating, small issues will slip under the radar until they grow into large, ugly problems. It's no good beating myself up over it. Since I ride without constant supervision I have to expect it. No, that doesn't mean I get to stop trying. If I stopped trying, stopped paying attention, I'd miss the sheer bliss of those moments when it all comes together, the joy that rockets my attitude into the stratosphere, and makes every cell in my body understand why I ride dressage. And I'd probably appreciate that view of Mt. Pilchuck, Rocky's antics, and random feathers a little less. What a shame that would be. Wonderful post, applicable to so many things in life.